I was fortunate to work with Mikio. While the result speaks for itself, I must add that I've never worked with a more professional, disciplined and talented designer. Ever. It has been a true pleasure and an honor. Fukusuke (福助) is one of the Japanese traditional characters which are said to increase the fortune and bring good luck. Formally dressed in a Kamishimo ceremonial dress with a big head and Fukumimi (plump ears, said to bring good fortune). Fukusuke has a distinctive appearance. The original form is said to be established in the mid Edo period. It became widely known after a Fushimi doll from Kyoto had used Fukusuke as a motif. Fukusuke's design clearly shows the aspects of Edo cultures such as Fukumimi, based on then-popular physiognomy; Kamishimo, a customarily-worn formal dress in the Edo period; patterned Kamishimo dyed with fine repeated Komon patterns; and Seiza, an upright sitting position which was popular in the mid Edo period. As folk religion spread among general public between the Edo and Meiji periods, good-luck-bringing Fukusuke was considered "Kami no okyaku (a guest of god)" as a god of happiness. And people put a Zabuton cushion under the Fukusuke doll to show courtesy. When the character was established, the motif was a baby-faced man. But since the Meiji era, the design has transformed into an appearance of a child under the influence of the childlike characters from the West such as Kewpie and Billiken. The Fukusuke icon was planned as part of the icon set for the EDO project launched in 2004, and is one of the motifs not chosen in the final selection stage. This time, based on the references which I gathered as I planned it then, it was finally visualized after taking five years to complete. 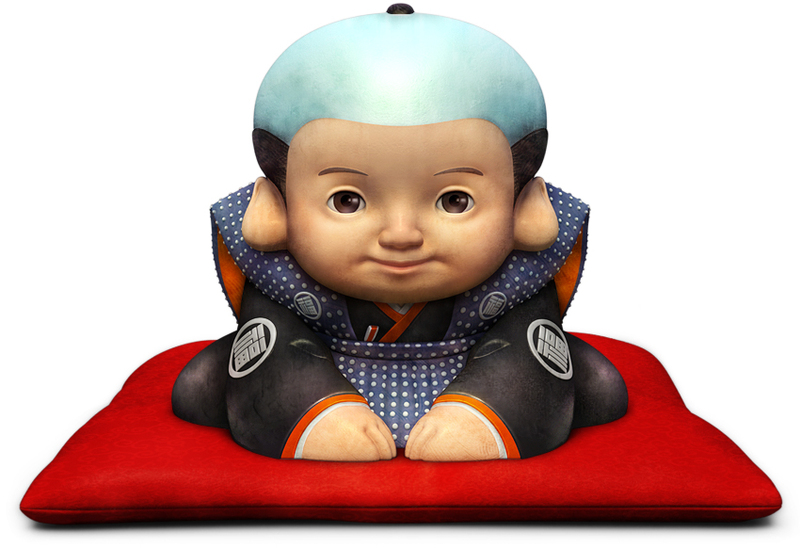 Keeping the basic design as a child-looking Fukusuke doll in mind, I intended to make it look modern. iFontuim is a document management application for amateur and professional genealogists for Mac OS X Leopard. It will be able to collect, store, organize, analyze, rate and cite genealogical materials such as birth certificates, censuses, and church book excerpts. Genea-IT and I worked together and created an application icon for this project. 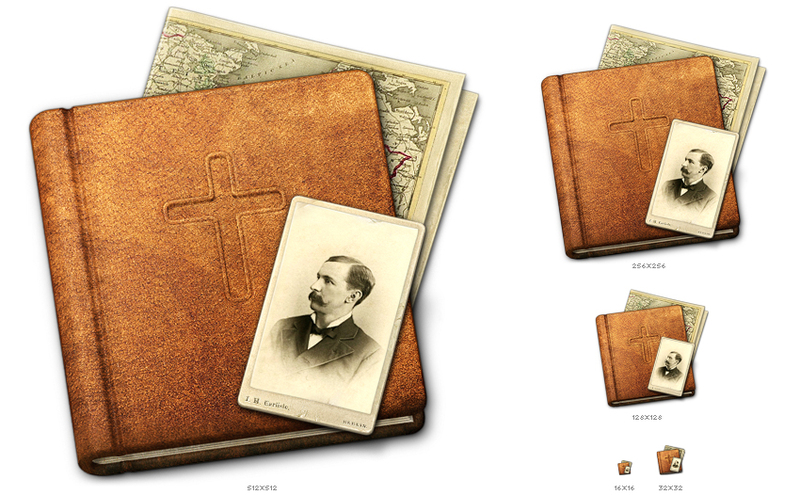 They needed an antique-looking image for this icon so I researched about genealogy and finally put together three images; a church book, an old map, and a type of small photograph, called carte de visite (CdV), as a component. And each element was refined using details as dents, wrinkles, and stains for the antique-looking concept. 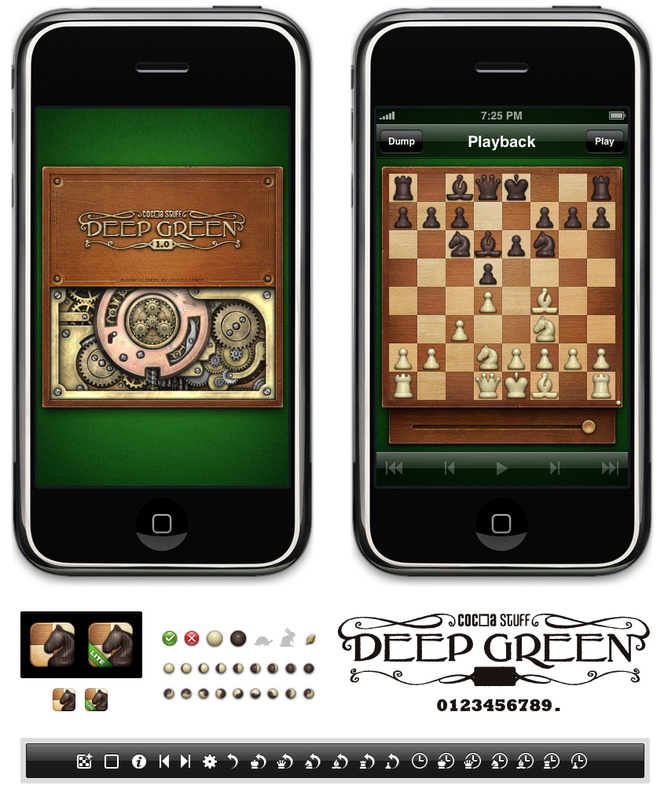 Deep Green is a chess application for iPhone and iPod touch. 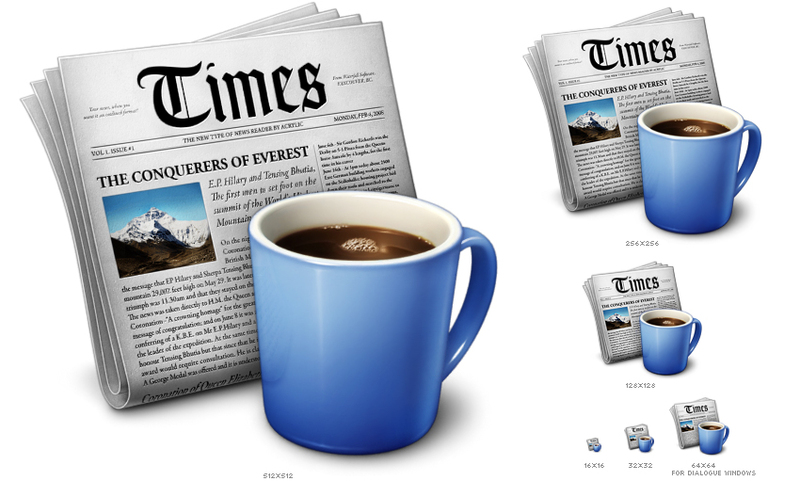 It's a feature-rich application in a simple, intuitive and very pleasing user interface. The original Deep Green was created for the Newton platform, and the year of 2008 marked 10 years since the developer Joachim Bondo released this multi-award winning application. Joachim and I worked together for about 6 months and created a classical/modern graphical user interface for this 10 year anniversary version. We intended to show the visual taste of the end of the 19th century or early 20th century on it. I researched the artistic styles in the periods a lot and designed it. There were a lot of keywords for creation such as clockwork, Steampunk, Art Nouveau, Arts and Crafts Movement, Expressionism, difference engine, and Industrial Revolution. The graphics of the clockwork, called Engine Back, is extremely detailed and therefore took a lot of time. All the parts, even the tiny screws, were produced independently as separate layers in the work file, and there were around 600 layers in total. Also there is a gear animation on the Engine Back as a secret feature. Doozla is an easy-to-use drawing application for children and it is developed by plasq, a company known for Comic Life and Skitch. 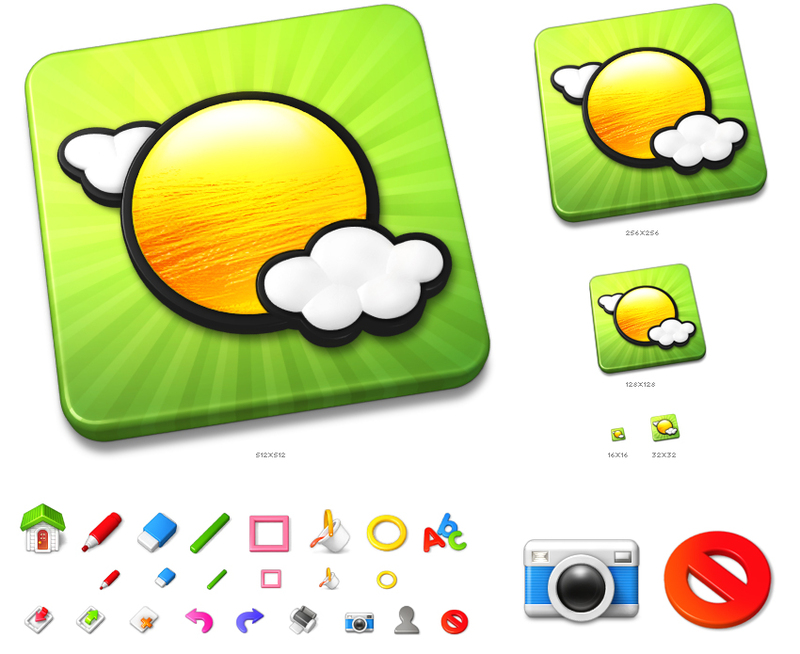 In this project, diverse interface designs such as the application icon, tool icons, and some part of background designs, were generated using the application. Icons of colorful and rounded shapes were designed for children with the concept of soft plastic toys. My name is Mikio Inose and I am currently living and working in Tochigi, Japan. I am a visual designer with over 10 years of experience. I have been working in this field since 1997. I offer various design services. Please consider me if you need detailed work for your project. Sorry, I'm not available to working with you at present. This portfolio includes exclusively my work since 2008. If you are interested in the rest of my work, please visit my other site, mikworks. I am always looking forward to hearing from you, so feel free to contact me in any case at mikio@mikioinose.com, or via my vCard. Copyright © 2009 Mikio Inose All rights Reserved. Grab the RSS feed. Powered by Movable Type.